This article intends to share the experience gained by both authors in the context of the project entitled "Workshop on Natural Hazards and their Perception", implemented by the Volcanological and Seismological Observatory (OVSICORI), of the National University of Costa Rica. 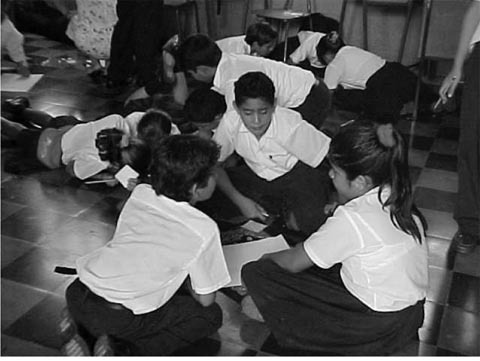 Approximately ten years ago, the issue of natural disasters was incorporated into national curricula in Costa Rica. This included preschool, the first and second cycles of basic primary education, and secondary education. Although this represented a significant progress, the approach applied had some problems, including a behavioral educational and formal strategy, a major focus on disaster response and a negative perception of nature. In response to this approach, the authors of this article have made efforts to include an educational unit on natural risks that draws on previous experiences, incorporates different practical aspects and applies theoretical and pedagogical principles. The activities related to the Workshop on Natural Risks and their Perception began in the year 2000, in the framework of another project entitled "Environmental Knowledge", implemented jointly by the Institute for Social and Population Studies (IDESPO) and OVSICORI. The primary goal of this project is to increase awareness of risk prevention within the education community. The project includes the application of a methodology for developing risk-perception maps in public schools. Along these lines, the ultimate purpose of the workshop is to develop an educational unit in the field of natural hazards for the fist and second cycles of basic general education. A number of public and private institutions have contributed to developing this workshop. These include the Ministry of Public Education (Office for Environmental Education, regional chapters for Cañas and Limón), the 911 Emergency Office of the Costa Rican Electricity Institute (ICE), The National Commission for Emergency Prevention and Response of Costa Rica (CNE), the National Power and Light Company (CNFL), the Municipality of San Jose, La Pacífica Farm, the Taboga Sugar Mill, and the Japan International Cooperation Agency (JICA). The first phase of the workshop includes dynamic activities with children from a number of selected schools chosen, through which they develop cognitive maps (Bosque Sendra, et. al. 1992). In this manner, students are able to freely express their concerns about those risks to which they are exposed (Images 1 and 2). The second phase involves both the analysis and the verification of the information included in the maps. At this stage, university students from different fields are able to participate, as long as they are registered in the optional course entitled "Natural Hazards and their Perception" taught by OVSICORI (Image 3). This project includes both coursework and field trips, and fosters the active participation of children, their parents and the community at large. It is worth mentioning that the analysis of the information included in the maps, as well as its verification in the field, is conducted by students of the aforementioned optional course. The third phase is a workshop in participating schools led by the students of the optional course. During this activity, the mental maps developed are analyzed jointly by the children and university students, who also role play situations involving the risks identified through previous research. This research serves as a valuable input for a more in-depth analysis of existing risks in the community (Images 3 and 4). Arroyo Ilera, Fernando and Pérez Bolo, Amparo, 1997. Reflexiones sobre el espacio geográfico y su enseñanza. Estudios Geográficos, Instituto de Economía y Geografía, Madrid. Pages513-543. Bosque Sendra, Joaquín, et. al., 1992. Prácticas de Geografía de la Percepción y de la Actividad Cotidiana. Editorial Oikos-Tau. Montero, Carlos, Compiler, 2000. Guía del curso: "Los Riesgos Naturales y la Percepción". (OVA201). Observatorio Vulcanológico y Sismológico de Costa Rica, Universidad Nacional. Montero, Carlos, et. al., 2001. Mapa de riesgos: comunidad de El Castillo, Costa Rica. Concurso mapas de riesgo. OVSICORI-UNA. Vulcanológico y Sismológico de Costa Rica, Universidad Nacional. Vulcanológico y Sismológico de Costa Rica, Universidad Nacional (OVSICORI-UNA). Costa Rica, Universidad Nacional (OVSICORI-UNA).